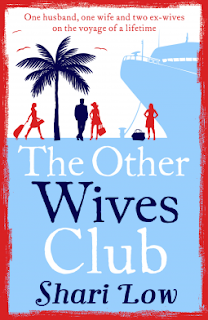 What They Say.....Three women thrown together on a surprise Mediterranean cruise to celebrate a milestone birthday of the man they all once loved. What could possibly go wrong? Tess Gold - the current wife. When Tess married Drew Gold, she knew his two ex-wives were still in his life. Now Drew has planned a luxury cruise to celebrate his birthday ... and the former Mrs. Golds are all coming too. Mona Gold - the second wife. When it comes to style, fashion editor, Mona, never puts a Louboutin wrong. Now it’s time to reclaim the only man she ever really loved ... if she can tempt Drew away from his new wife for a second time. Sarah Gold - the first wife, the original. When Drew left her for Mona, Sarah’s emotions went into hibernation. What I Say....Shari Low's books are the perfect way to pass a weekend.. I haven't read one yet that didn't just make me happier. Drew's desire to keep his family close is wearing a little thin on all of his ex-wives and their significant others, but he is too full of himself to notice. He's not a bad guy, he just really doesn't seem to think the positions he is putting these women in is awkward at all. His new wife, Tess, is currently struggling with the lack of time that she already has with her husband, so she is looking forward to a peaceful cruise, hoping they can recapture some of their magic when they don't have any other distractions around them. Mona, his last ex-wife, is tired of her current rich husband, and wants to get back together with Drew - so this cruise comes at the perfect time for her. Sarah Gold, the first wife just wants to be left alone by her ex. She's feeling frumpy and old and would just as soon not be around either of the beautiful Mrs. Golds. When they embark on the cruise, bringing all of their current husbands, children, stepchildren with them, new alliances are made, new confidence is found, and the right people get what is coming to them - this is all part of what makes it such a satisfying read!